Thank you - you are awesome. Like FiveM? Consider supporting us on Patreon! FiveM allows servers to use custom cars, maps, weapons, and more. FiveM allows servers to keep the original game AI, so you'll never be alone. You can also PvE! FiveM doesn't modify your GTA V installation, so you can switch between GTA:O and FiveM without getting banned. FiveM uses the GTA:O network code with improvements, so you'll have the best sync around. Building upon years of development on the CitizenFX framework, which has existed in various forms since 2014, FiveM is the original community-driven GTA V multiplayer modification project. We strive to put the community ― both players, server owners, and the greater GTA mod community ― first. 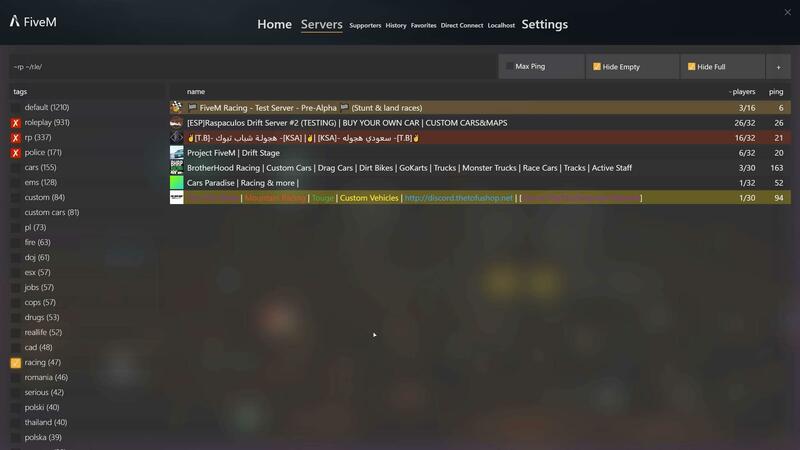 FiveM is a multiplayer modification framework providing many tools to personalize your server's gameplay experience. Using our advanced features, you can make whatever you wish: roleplay, drifting, racing, deathmatch, or something entirely unique? Your skills are the limit! A short and concise dynamically typed language, easy to pick up. Static typing and object orientation, for those advanced features. New: existing both on client and server, also with Node.js support server-sided. Server system requirements: x86-64 system running Linux or Windows (7/2008 R2+), decent upstream connectivity, multi-core processor recommended. The person serving the snail can garnish it with various assets. Servers may ban at their discretion. Merely as Rockstar North used to be called DMA Design. Cheats offer scripting extensibility, languages used for these vary. Will I get banned from GTA:O for playing FiveM? Nope! FiveM does not interact with the Rockstar Online Services other than to validate your game copy the first time you launch it. This validation emulates the game's interaction, and can not be detected by Rockstar. It also doesn't modify your game files at all, even when downloading server assets, so you don't have to do anything to move between FiveM or GTA:O. Why are you asking me for login information? We need to do this to check if you actually own GTA V, when our automatic validation fails. This data will only be sent to the Rockstar Social Club services, and is not transmitted to us, or any other party. Only 32 slots? Why not more? We currently only support 32 slots due to limitations of the original RAGE network framework. We're also working on a completely new synchronization framework called OneSync, which should allow higher slot counts and is available in preview. Will OneSync require me to redo my server code? No, all your existing scripts will still work with the game when OneSync is released, with minor changes to support higher player counts. Of course, OneSync will enable new, better ways of doing certain things you do in your scripts, so you might want to take advantage of those when they're released. My FiveM crashes, what should I do? You should post a topic on the forums with the problems you are having. Please make sure to provide all information requested in the error format, so we can help you better. What's the difference between FiveM and FiveReborn/MultiFive? FiveM is the original project both FiveReborn and MultiFive were based on. The current FiveM project originated from a merger between FiveReborn and a new development group called the CitizenFX Collective. Modifications, not multiplayer. FiveM also allows you to modify the singleplayer experience, or well, it will in the future. I want to run a server, how do I do so? There's probably an installation guide on the docs telling you how to do so. If not, check the forums! You can also rent a FiveM server from our recommended server provider and support the project. FiveM is not affiliated with or endorsed by Rockstar North, Take-Two Interactive or other rightsholders. Any trademarks used belong to their respective owners. FiveM is © 2016-2019 by the CitizenFX Collective.